The 2018 Climate Change and Indigenous Peoples Lecture will take place at 6:30 pm on Wednesday, May 9, 2018 at the University of Oregon Many Nations Longhouse and feature Dr. Margaret Hiza Redsteer and Dr. Karletta Chief. This lecture is part of the UO Symposium on Environmental Justice, Race, and Public Lands taking place May 9-11, 2018. 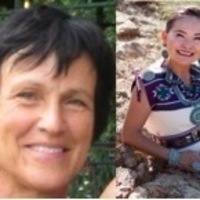 Dr. Karletta Chief (Diné) (Right) is an Assistant Professor & Extension Specialist in the Department of Soil, Water, and Environmental Sciences at the University of Arizona (UA). Her research focuses on understanding, tools, and predictions of watershed hydrology, unsaturated flow in arid environments, and how natural and human disturbances impact water resources. Dr. Margaret Redsteer (Left) is a research scientist who focuses on the perturbations in climate and ecosystem processes and their linkages to landscape stability in order to unravel and understand the impacts and vulnerabilities we face from shifts in seasons, and how these may increase hazards, alter vegetation composition and degrade ecosystem services. Dr. Kyle Whyte from Michigan State University will be introducing the speakers. He is currently serving as the Timnick Chair in the Humanities and is also the Associate Professor of Philosophy and Community Sustainability.